Engineering student Antoine El Feghali represents LAU and the region at the Procter & Gamble European Financial Leadership Seminar in Geneva. Antoine El Feghali (right), LAU Byblos engineering student, represented his university and the region at Procter & Gamble's European Financial Leadership Seminar, held in Geneva, Switzerland. 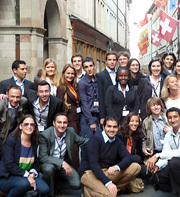 The seminar brought together top students from Europe, Middle East and Africa. Antoine El Feghali, an LAU Byblos engineering student, represented his university and the region at Procter & Gamble’s prestigious European Financial Leadership Seminar, held annually at the beginning of May in Geneva, Switzerland. 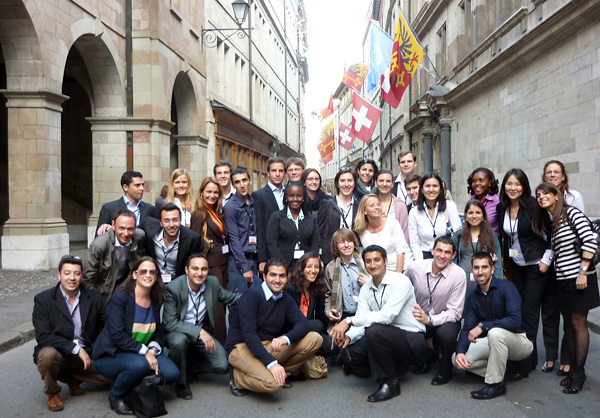 The selective five-day (May 1-5) seminar brings together top students of more than 70 nationalities from Europe, Middle East and Africa. The students collaborate in “running” a multinational business (based on an actual business case study), while developing their management and financial skills through interaction with P&G executives. Travel and accommodation expenses for all participants are paid by P&G, and competition for slots is intense. El Feghali was one of 250 Lebanese applicants this year. After several interviews, he was shortlisted, then finally selected. The selection process included multiple stages. The initial screening was done through verbal and quantitative reasoning tests as well as an IQ test. In subsequent interviews with P&G’s Financial Planning and Analysis Group manager, along with other P&G managers in the company’s Lebanese and Egyptian offices, El Feghali was asked to solve a number of case studies to demonstrate financial and analytical reasoning. P&G has been hosting the European Financial Leadership Seminar annually since 1991. The company gave a presentation on financial careers at LAU Byblos in mid-January, at which Yamen Fakhredinne, financial manager at P&G, encouraged LAU students to apply to participate in the spring seminar. The presentation was organized by the LAU Byblos Student Services (Career Guidance) Office, which assisted El Feghali throughout the application and selection process. “LAU helped me a lot through its career guidance office in Byblos, led by Ms. Rana Sakr,” says El Feghali. He will share his experiences with fellow students during a presentation on May 23, at 12:00 p.m., in the Frem Civic Center, Room 205, at LAU Byblos. The event will also include presentations by student Mabelle Abi Ramia who attended the P&G Academy in Lebanon last year, and LAU graduate Antoine Choueiry, who currently works at P&G. To learn more about the event and to sign up, contact Rana Sakr, LAU Byblos guidance officer, at rana.sakr@lau.edu.lb or ext. 2350.